The staff of HAMMER AND NAIL CONSTRUCTION is trained in almost every aspect of building construction and maintenance. Although we specialize in residential and commercial interior remodeling, we also offer full exterior building services as well. Most of the work we are hired to perform is completed by our own staff of highly knowledgeable and dependable people. Our staff has been trained in rough carpentry, drywall installation and finishing, painting, insulation installation, proper demolition techniques, tile installation, electrical, plumbing, HVAC systems, and much more! We will use sub-contractors only when we feel that they can provide higher quality at an equal to or lower price than our own staff can provide. Unlike most Contractors, we work around your schedule, not ours! 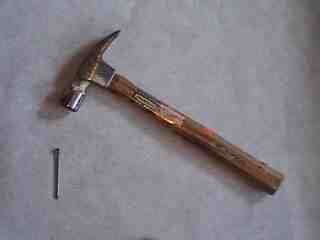 HAMMER AND NAIL CONSTRUCTION can meet all of your rough and finish carpentry needs. Our staff has been trained in the installation of wood and metal studs, drywall (including mudding and taping), moldings, countertops & cabinets. Since early 1998 when we expanded into much more than just a painting and demolition company, HAMMER AND NAIL CONSTRUCTION has performed remodeling services for hundreds of happy customers. Our tasks have included everything from window, siding, roofing, and gutter installation to alterations to assist the physically challenged to kitchen and bathroom remodeling to basement and attic finishing. From the simplest design to the very detailed work of custom cabinetry, Corian countertops, and stone tile installations, we can deliver qualified service to meet your needs. Let our experienced versatile staff create the space that will meet your needs for years to come! If you are looking for fast, courteous, and dependable installation of tile, hardwood flooring, linoleum, ceramic tile, or carpet, then HAMMER AND NAIL CONSTRUCTION is the one to call. Unlike most other contractors, we not only do a top-notch job installing the products, we also clean up the flooring so that our customer's can begin enjoying their new flooring immediately without having to clean it first! Since all HAMMER AND NAIL CONSTRUCTION employees are trained in most aspects of building construction, we are highly capable of repairing dripping faucets, leaky toilets, minor electrical problems, holes in drywall, burnt light bulbs, broken doors, etc. From replacing a single hard to reach light bulb to a long list of repairs, we are happy to accomodate you. Our staff has performed hundreds of equipment and furniture moves for both our residential and commercial clients. We have even moved computer equipment, and in most cases, we set them up in working order before we left the site! As much as we enjoy creating highly functional spaces for our customers to enjoy, usually the first step in any construction project is some form of demolition. Whether landscaping is to be removed to make way for the new addition or a room is to have everything removed back to the studs, our staff is proficient in removing everything in a systematic manner that reduces the possibility of damaging any area outside of the scope of the remodeling project.